Parliament car crash terror suspect named after Birmingham raids. The car used in the suspected terror attack at Parliament on Tuesday was driven around London for hours before crashing, it has emerged. Police say the vehicle, registered in Nottingham, drove to the capital from Birmingham. 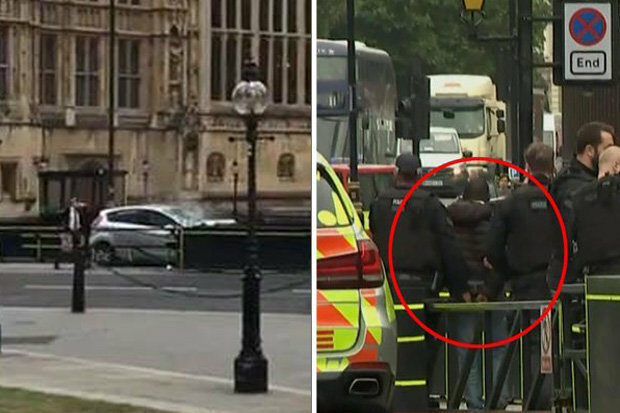 The terror suspect arrested by police after a car crashed into cyclists and pedestrians outside Parliament has been named as Salih Khater. Three people were injured in the crash, which happened at 7:40am in the height of rush hour in Westminster. Footage of the silver Ford Fiesta showed the vehicle travelling westbound along the Palace of Westminster before it swerved into eastbound traffic. The car hit pedestrians and cyclists before smashing into the safety barriers. The driver of the car, a 29-year-old man, who is a UK national, was arrested at the scene by armed officers. He was arrested on suspicion of preparation of a terrorist act, contrary to section 5 of the Terrorism Act 2006. Today, the suspect was named as Salih Khater, 29, who was originally from Sudan. He was arrested on suspicion of preparing an act of terror. On Facebook he describes himself as a shop manager, who studied at the Sudan University of Science and Technology. Scotland Yard are continuing to quiz him after the Tuesday morning crash, which saw 200 officers flood the streets around Parliament. Last night, counter terrorism officers searched an address on Stratford Road in Sparkhill after the Westminster car crash. They visited a flat above an internet cafe and later left with items in plastic bags. The silver Ford Fiesta collided with cyclists and pedestrians before crashing into a security barrier in Westminster just before 7.40am on Tuesday. Last night counter terrorism officers removed items from what is believed to a flat above an internet cafe on the Stratford Road in Sparkhill. Officers could be seen leaving the premises carrying items in plastic bag. Earlier Roger Godsiff , MP for Hall Green, said the terror suspect lived in his constituency. He said: “My deepest sympathies to the cyclists and pedestrians who were injured in the attack. As well as the Hall Green area his constituency includes Moseley, parts of Kings Heath, Sparkbrook and Sparkhill.